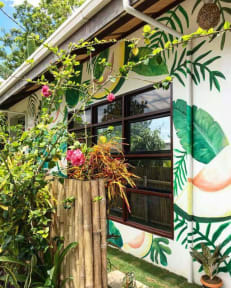 Avocado Tree Hostel v Siargao Island, Filipíny: Zarezervujte nyní! 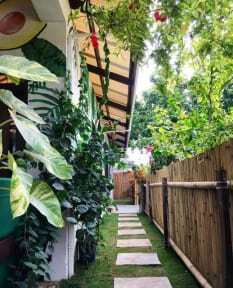 Avocado Tree Hostel is Siargao Island's newest, value-for-money hostel. Located in General Luna, surrounded by vibrant community of surfers and backpackers. Avocado Tree Hostel offers 30 comfortable beds: 16 in a fan room, and 14 in an air-conditioned room. There are four bathrooms and each guest will be provided with towel. When you have some down time and would just like to chill out at the hostel, we have common areas in our blossoming garden. We offer simple breakfast, snacks, drinks, daily made sandwiches and fresh coconuts. We offer surfing lessons for both beginner and intermediate surfers at the most beautiful spots with clear blue water. Avocado Tree Hostel is near the main road; we offer motorbike rental that will make your travelling around easier. The beach is in walking distance, 5 minutes away from the hostel as well as the city center with numerous restaurants, bars and shops. It is important to us that everyone at our hostel feels happy and we will make our best to make your stay in Siargao special. 3. Check out at 11:00. 5. Reception working hours 07:00-20:00.